Taking place at the National Exhibition Centre (NEC) Birmingham from the 2nd - 5th November, discover a whole new world full of creative inspiration all under one roof - and this year there is no compromise! We will be broadcasting live for a full 4 hours a day joined by our very own presenter enthusiasts including Leonie Pujol, Yiannis Morgan, Hayley West, Dave Bradford and Matt MacNamara. Conducting live demonstrations, audience Q&A’s and photo signing opportunities, this is your opportunity to feature on live TV - so set your TV sets to record, this could be your claim to fame! We are also very pleased to announce that a number of the Hochanda family will also be joining us … confirmed exhibitors include Dawn Bibby, Card-io, Imagination Crafts, Sweet Poppy Stencils, Tonertex Foils, Powertex, Lavinia Stamps and more. With single day, two day and three day tickets available at a discounted rate, get your tickets early - beat the quease and save with Hochanda. Single day tickets start at just £12 for adults whilst seniors receive an additional discounted rate of £11; and two day tickets start at just £18 and three day tickets at £23. Doors open at 9:30pm every day closing at 5:30pm (5pm on Sunday). We are also very pleased to announce that ourselves and the ICHF have agreed an exclusive offer for all our Freedom members. 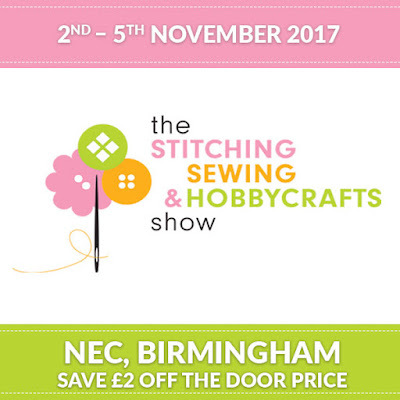 For existing subscribers and any new members, you are eligible for a 2-for-1 offer on all Stitching, Sewing and Hobbycrafts Show tickets. So why not treat a friend at no extra cost? Select the Freedom tickets, ensure you're logged in and save!